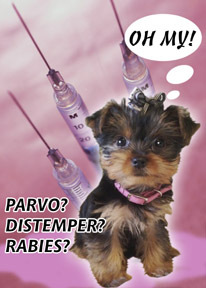 Over the years, there have been many questions surrounding vaccination programs for our pets, ourselves and our children that have become center stage lately. This debate has certainly created and is perpetuating much controversy as we begin to look into the safety and efficacy of these products. The pharmaceutical industry wants us to believe that we must vaccinate to prevent disease, but is that true? In most parts of this country, pets are only required to have protection against one disease and that is rabies. This is because of possible transmission to humans through a bite. It should be noted that the United States has been certified rabies free since 2004 by the Center for Disease Control. We have found that the theory behind vaccination is to identify a potential disease causing a pathogen and expose the body to a safe form of that pathogen to build an immune response which subsequently allows the body to have a defense against that disease. Unfortunately, this theory is flawed in many ways as has been demonstrated in the human population with recent outbreaks of measles, mumps, and other conditions in vaccine compliant groups. Ultimately, the best protection for disease control is a strong healthy immune system. Before any should make a decision as to whether to vaccinate or not, be sure to take a look at these several factors. The first is the risk to your pet. What disease conditions are they going to be exposed to and how dangerous can this condition be? If the likelihood of exposure is minimal as in a house cat or dog, then we must look to physiological factors such as the age of the pet, whether the disease only affects only certain age such as puppies and kittens, is it only seasonal like the flu, or is it self-limiting like kennel cough. It is very obvious that the pharmaceutical, medical and veterinary industries have a huge profit motivation in the sale of vaccines. We must look beyond their advice that we NEED these vaccines and weigh the benefits and the risks involved in vaccination. Are vaccines safe? Do we know how they were tested and if they are truly effective? Do they really prevent us getting a particular condition or would the likelihood be minimal anyway? What are the ingredients in the vaccines and are we comfortable injecting them into the body? We know that most contain toxic heavy metals and chemicals such as Mercury and Aluminum that are banned from disposal in our environment. Are they necessary and what is the risk to the pet’s health in having these in the body? Something we feel is another very important concern are the potential adverse events or side-effects that can occur. In humans, we can articulate how we feel, whether there is pain, tingling, head and muscle aches or other issues. Unfortunately, our pets cannot express these adverse events. Of course we all look to our medical professions to give us the right advice however, ultimately we must make the right decisions ourselves. Be sure to ask the right questions, do our own research, and use that knowledge to make the right choices. Vaccination is neither a natural process nor guaranteed safe or effective. We must approach this procedure with caution. We are here to help educate all animal lovers and pet owners in order to provide the most natural and safest regimen to achieve longevity in pets through a healthy and happy lifestyle. ← We all need a fresh start…even our pets!